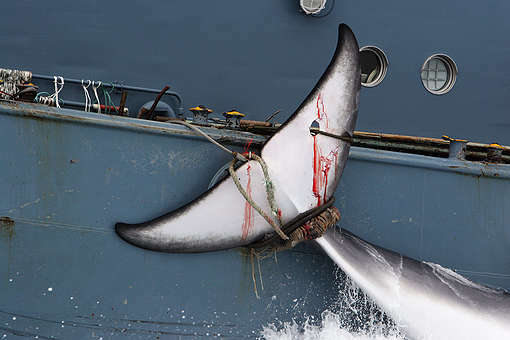 Tokyo, Japan – Greenpeace condemns the Japanese Government’s formal announcement today to officially withdraw from the International Whaling Commission (IWC), with the intention to resume commercial whaling in its territorial waters and exclusive economic zone (EEZ). Previous media reports had indicated that government of Japan was considering pulling out of the IWC, but the announcement today formalises the country’s intentions to leave the organisation. “It’s clear that the government is trying to sneak in this announcement at the end of year away from the spotlight of international media, but the world sees this for what it is. The declaration today is out of step with the international community, let alone the protection needed to safeguard the future of our oceans and these majestic creatures. The government of Japan must urgently act to conserve marine ecosystems, rather than resume commercial whaling. “As a result of modern fleet technology, overfishing in both Japanese coastal waters and high seas areas has led to the depletion of many whale species. Most whale populations have not yet been recovered, including larger whales such as blue whales, fin whales and sei whales. “The world’s oceans face multiple threats such as acidification and plastic pollution, in addition to overfishing. As a country surrounded by oceans where people’s lives have been heavily reliant on marine resources, it is essential for Japan to work towards healthy oceans. Japan’s government has so far failed to resolve these problems.